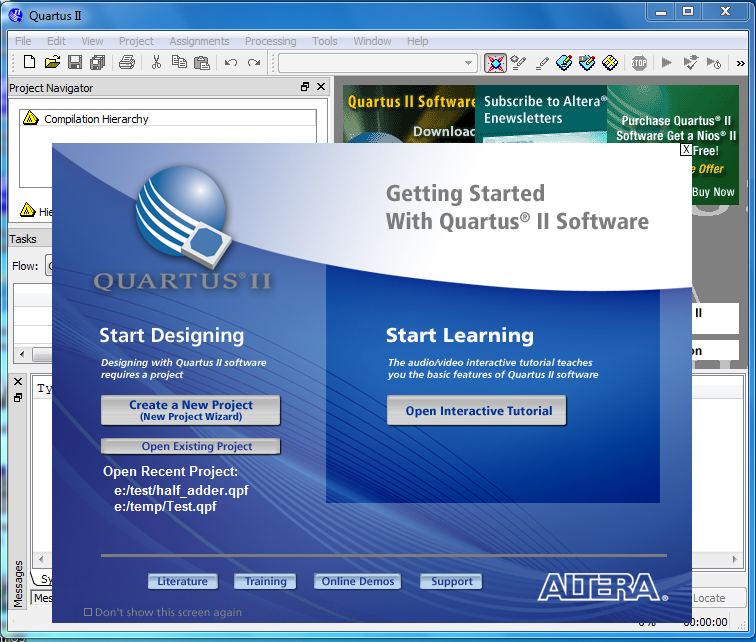 Altera Quartus II is available for Windows and Linux. The instructions here are from version 11.0, with some updates for versions 12.0, 12.1 and 13.0. I try to keep it up to date. On my YouTube channnel, I have a series of videos about Quartus II. Note: Since version 11.1 of Quartus II, the QSim simulator has been automatically included with Quartus II, for Windows and Linux. For simple simulations, it is easy to use. Following are instructions for simulations using either one. 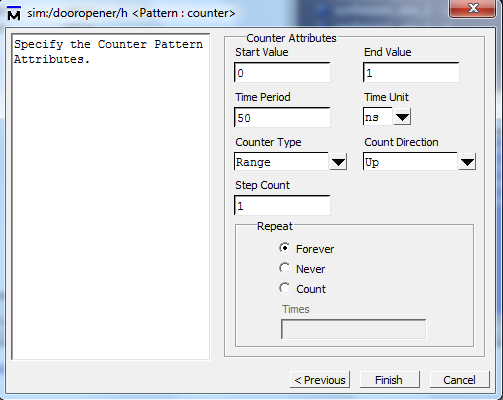 In this tutorial, we will show you how you capture the schematic design for the automatic door opener circuit using Altera Quartus II software. We are designing a circuit for an automatic door like those you see at supermarkets. The door should open only when a person is detected walking through or when a person presses a switch (such as the wheelchair button) to have the door open. The door should only operate if it has been unlocked. To get to your I: or your Home Directory double click on My Computer icon on the desktop. Copy this directory from the I drive to the E drive. There are currently problems saving files directly to the I drive. Be sure to copy your files back to the I drive after you are done. 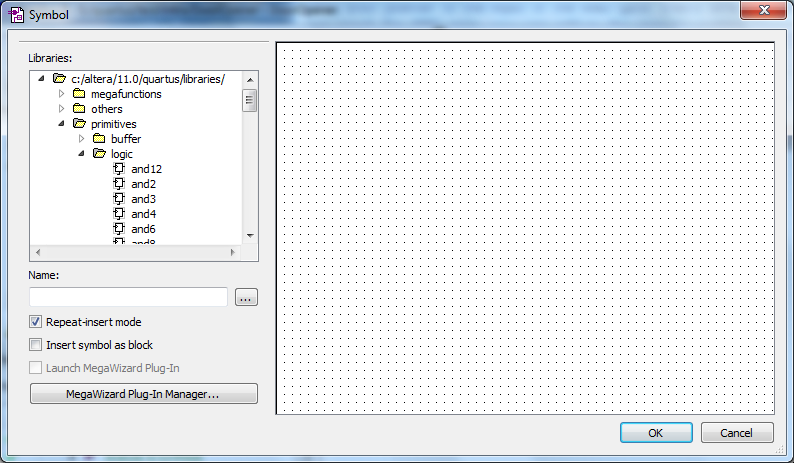 Select the File → New Project Wizard; a window like the following will appear. To select the working directory use the button to browse and select E:\CP120\intro. Name the project DoorOpener. (Note that the next field gets filled in automatically.) Select Finish. Don't uses spaces in file or directory names. Select File → New - A window as seen in the following picture will open. Select 'Block Diagram/Schematic File' and press OK. This should open a pane where you will design your circuit. This pane is designated Block1.bdf. 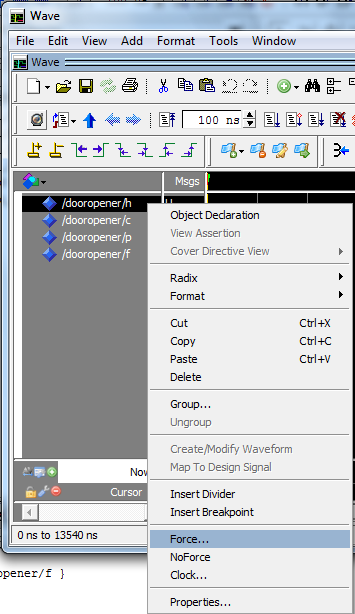 Save this graphic design file as DoorOpener in your "intro" directory. The file will be given the bdf extension; bdf stands for block design file and contains schematics, symbols or block diagrams. 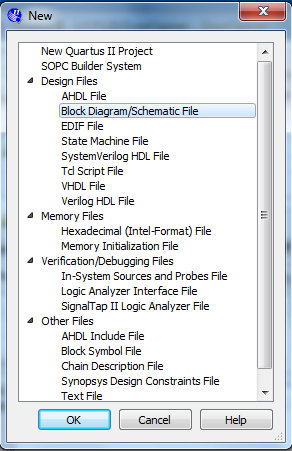 There is a toolbar on the Block Diagram/Schematic File drawing pane. (This toolbar is also known as the palette). Select the A from the palette. Select a point near the top left in the window with the left mouse key. Type your name and then hit the Enter key. 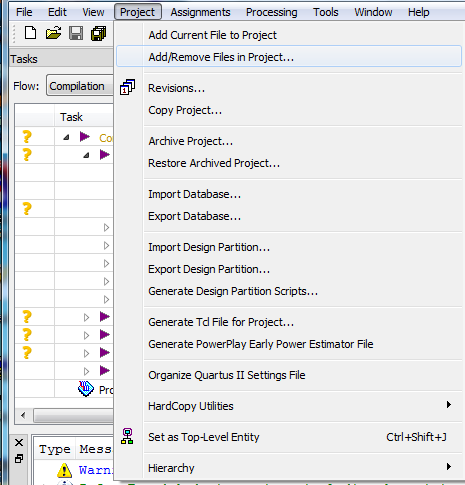 Type your project name and then hit the Enter key. Type the following equation, f = hc' + pc' , and then hit the Enter key. Hit the Esc (escape) key to end text additions. Click the library icon from the palette. 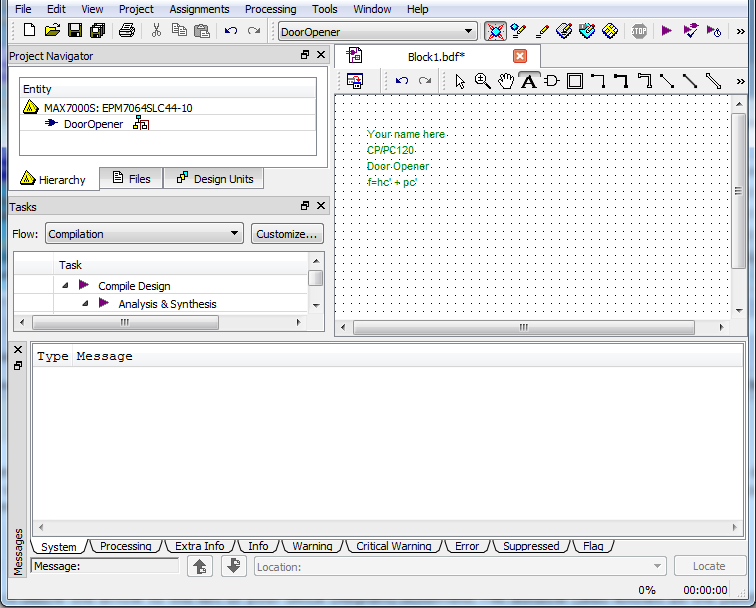 The Symbol dialog box will appear. 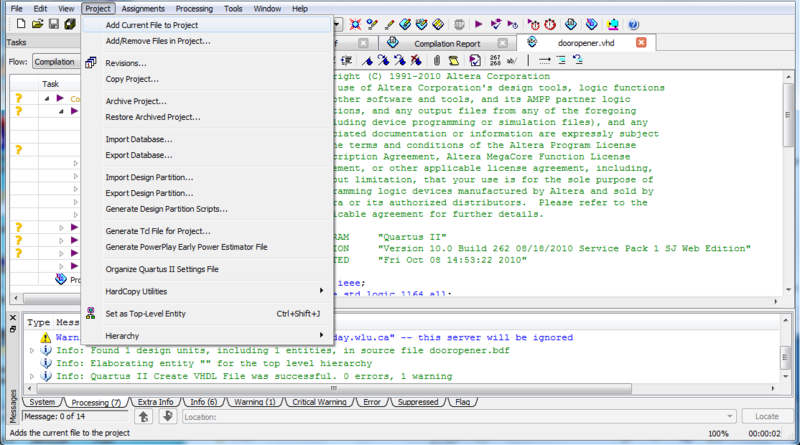 This window lists the available Altera libraries as seen in this image. Expand the /altera/〈current-version〉/quartus/libraries folder, expand the primitives folder and then expand the logic folder. In the logic folder, select the and2 component by double clicking on it (or by selecting it with a single click, then selecting OK). 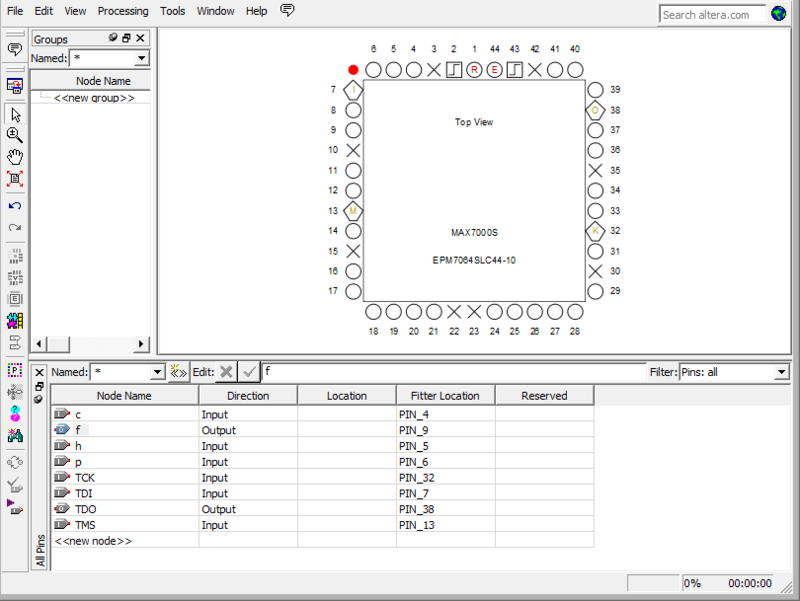 Click the pointer at the desired location in the Block Diagram/Schematic Editor window to insert the AND symbol into the design file. Repeat these steps to enter an OR (or2) gate and a NOT (not) gate. In the same manner that you placed a gate onto the palette, add three input pins and one output pin from the Symbol libraries. Input pins can be found under primitives | pin | inputs. Output pins can be found under primitives | pin | outputs. Name your input and output pins as you name them in your equation. Double click on the pin name to change its name. Never use spaces in pin names; e.g. "input 1" is a problem - "input1" and "input_1" are ok.
Rearrange your devices in approximately the placement you would like for the logic diagram you are trying to construct. You can move a component by selecting it with your mouse, holding down the left button and moving it to another location on the palette. Save your design. It is a good idea to save your design often, just in case something bad happens . Save the bdf file with the same name as the project. Don't use spaces in any file names. Select the orthogonal node tool. Place your pointer on the output of one of the input pins and hold the left mouse button down. You should see a cross-hairs or + appear at the output. 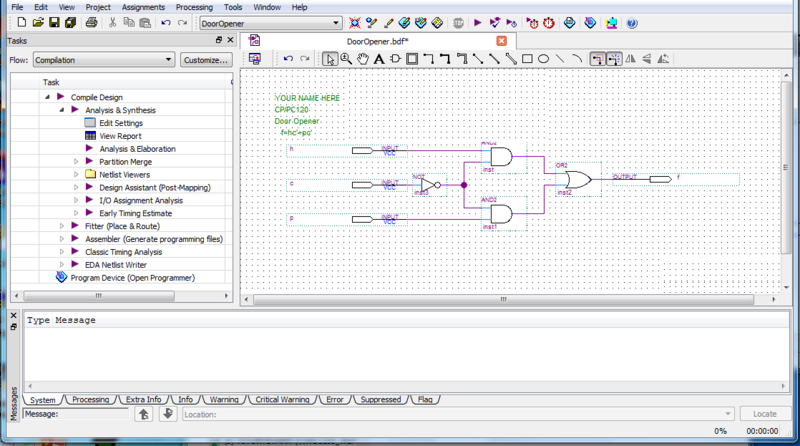 Drag your pointer to the input of the AND gate. Every time you release the mouse key, the line (wire) ends. If your wire did not reach the AND gate, you can add to the wire by putting your mouse over an end of the wire and again selecting it with your left mouse button and dragging your mouse to another position. Don't run wires along the edge of a device. This can cause simulation problems. Don't leave inputs and outputs right next to the chips. Make sure you can actually see some wire between them, otherwise you may have simulation problems. Note: Make sure you do not make the wire too long. If you drag it too far you will see an x; and this is considered an open connection and your design will not compile. To delete a wire or a portion of a wire, simply click on it (it should change color to indicate selection) and press the delete key. If wires are connected to the component as you are moving it, the wires will drag and stay connected to the component. This is referred to as "rubber banding" and is a feature of all major schematic entry design packages. (You can turn rubberbanding on and off using the rubberbanding tool. )Add the rest of the wires needed to connect the logic diagram. The window should look something like image below. Save your design. We will not print today. But you will need to know how for your project. The programmable device which we'll use for our design can be chosen now. Select Assignments | Device from the pull-down menu. Select MAX7000S from the "Family" pull-down list. 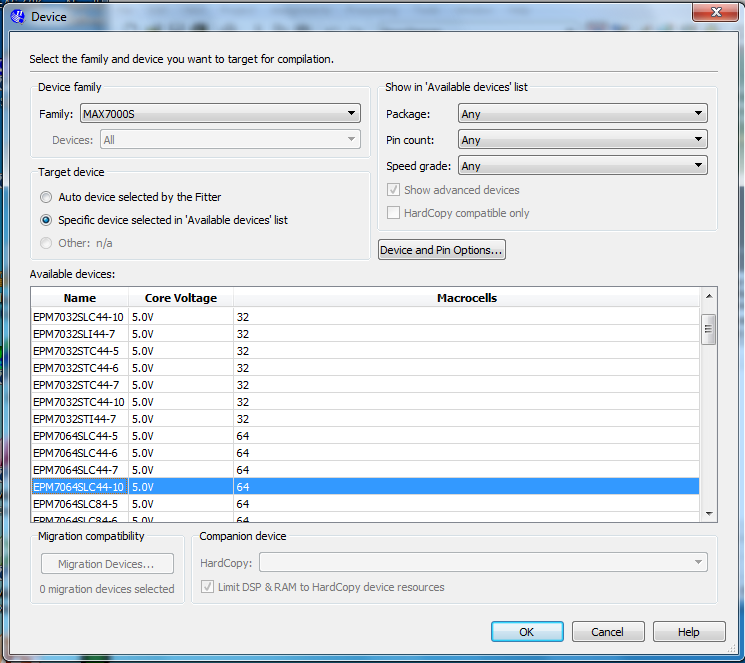 Select the "Specific device selected" and then choose EPM7064SLC44-10, which is the device we are using in our lab. Select "OK."
If you get a message like this, don't worry; it's fine. Click on Processing | Start Compilation to start compilation. If you're using a version of Quartus II lower than 13.0, use the instructions for earlier versions. Note: In version 13.0 of Quartus II, QSim can be opened directly from within Quartus II, however it only works with Cyclone devices. If you've already chosen a non-Cyclone device, switch to a Cyclone device to do the simulation. Once you know your logic is correct, you can switch back to your original device. To open QSim, File | New | New University Waveform File. Select Edit | Insert | Insert Node or Bus. Select the double right arrow to choose all. If you have multiple inputs, you can select a bunch and group them with one counter. 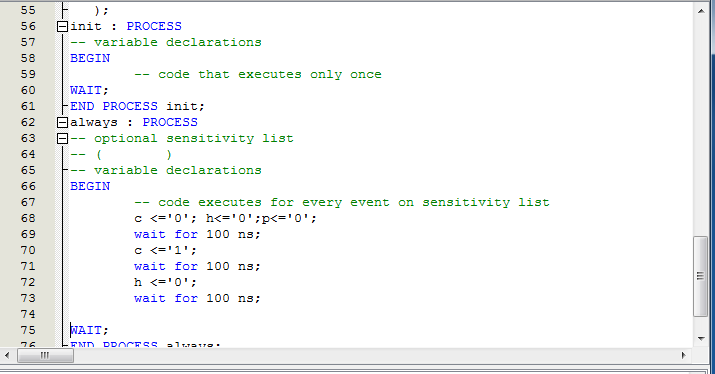 Select your input(s), and pick Overwrite Count Value. 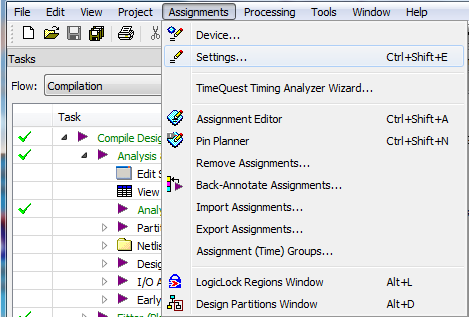 In the Main window, select Simulation | Options and then select Quartus II Simulator. Select OK. Note: If you haven't chosen a Cyclone device, the Quartus II Simulator option will be greyed out. In the Main window, select Simulation and then select Run Functional Simulation. 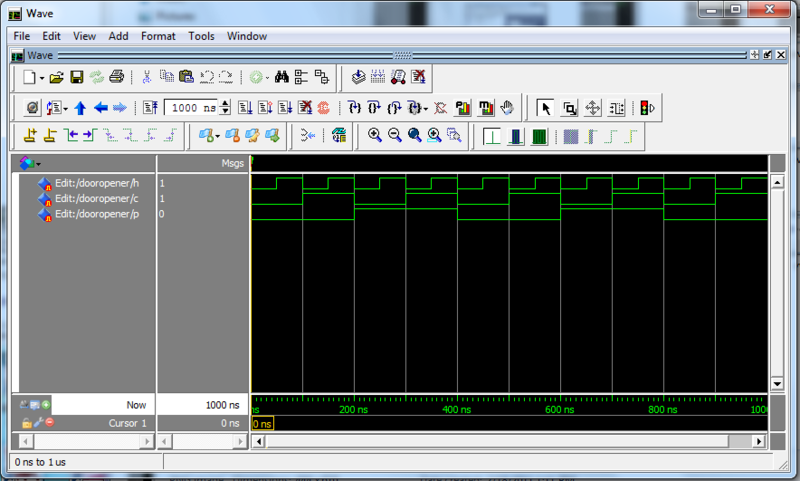 Now you should see your simulation output with the outputs defined. Note: The file will indicate "read-only" meaning you can't edit it. You can navigate around the timeline, zoom in and out, etc. This part of the output shows that when the inputs are all zero, the output is also zero. This part of the output shows that when c and h are low, and p is high, the output is high. This part of the output shows that when c and p are low, and h is high, the output is also high. You can repeat this process to check all of the eight possible input combinations. Now if you want, you can go back to the simulation settings and choose Timing instead of Functional to see the effects of propagation delay. In the Main window, select Simulation and then select Run Timing Simulation. Open the Altera U.P. (University Program) Simulator, also called QSim. 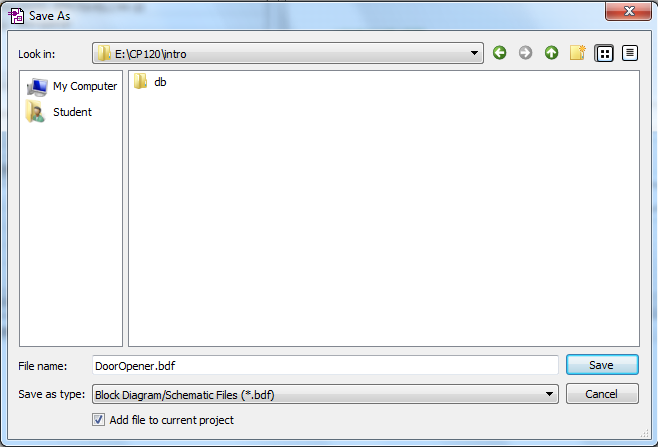 Select File | Open Project and choose your project file from your project directory. Select File | New Simulation Input File. You can change the rate at which a counter counts using the dialog. Select File | Save As to give this file a name in your project directory. 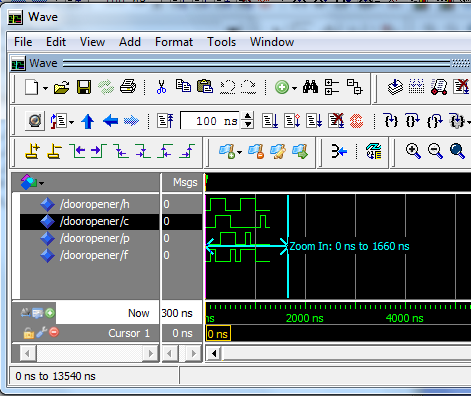 It will have a VWF extension for Vector Waveform File. 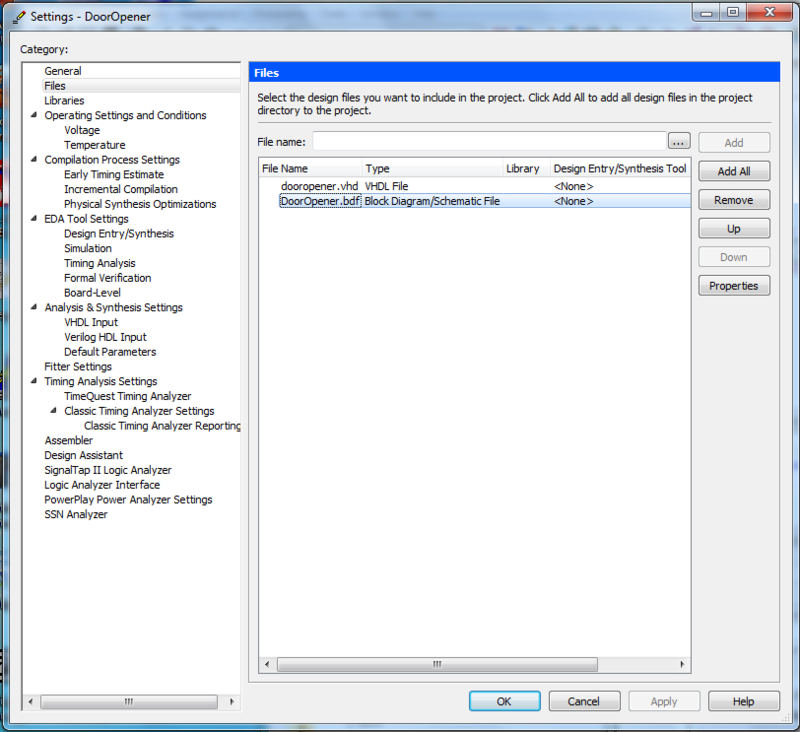 In the Main window, select Assign | Simulation Settings and then select the file. Select Functional Simulation. Select OK.
Click the Start Simulator button. You should get a message saying "Generate Simulation Netlist was succesful". Click OK.
You should get a message saying "Simulator was succesful". Click OK.
You should get a message from Quartus saying "This file is read-only and cannot be edited". 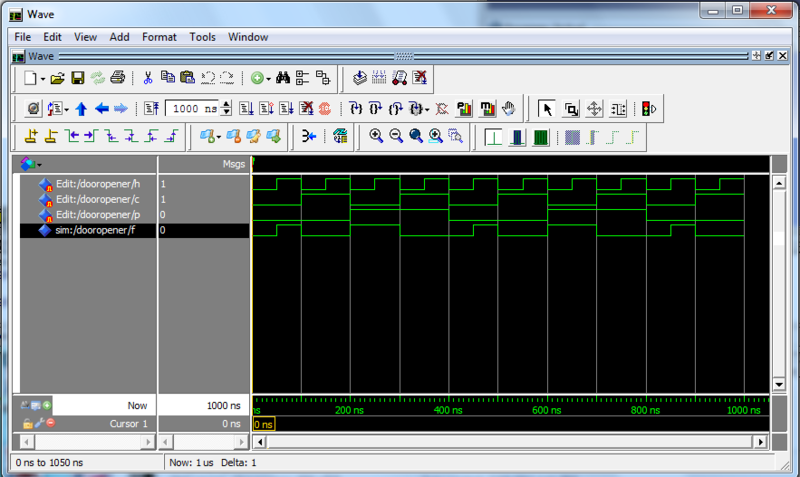 Click OK.
Now you should see your simulation output with the outputs defined. Before simulating, some preparation is required. NOTE: This is DONE ONCE PER PROJECT and the information is stored with the project information. Select Assignments | Settings. 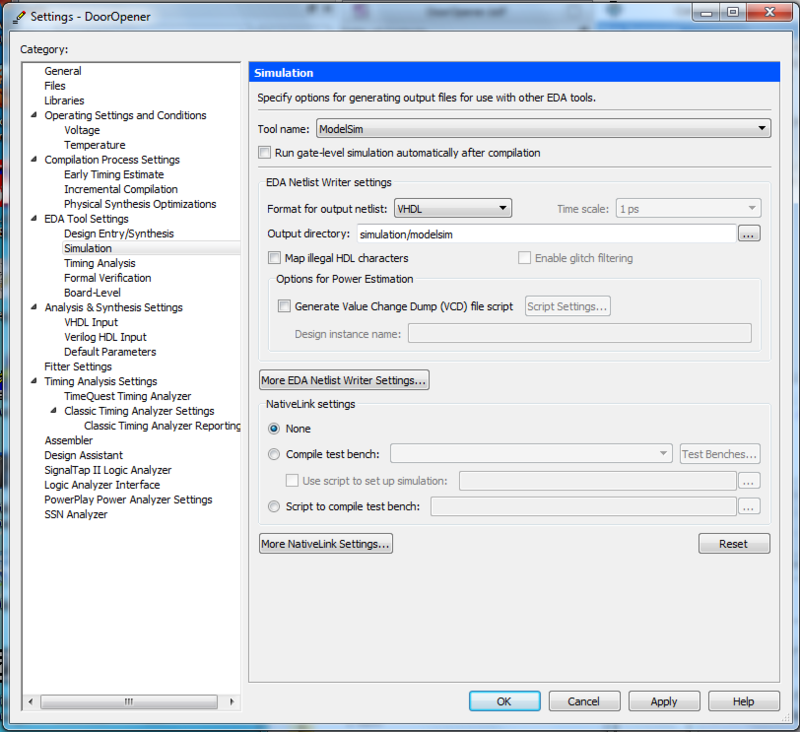 The Settings dialog box appears. 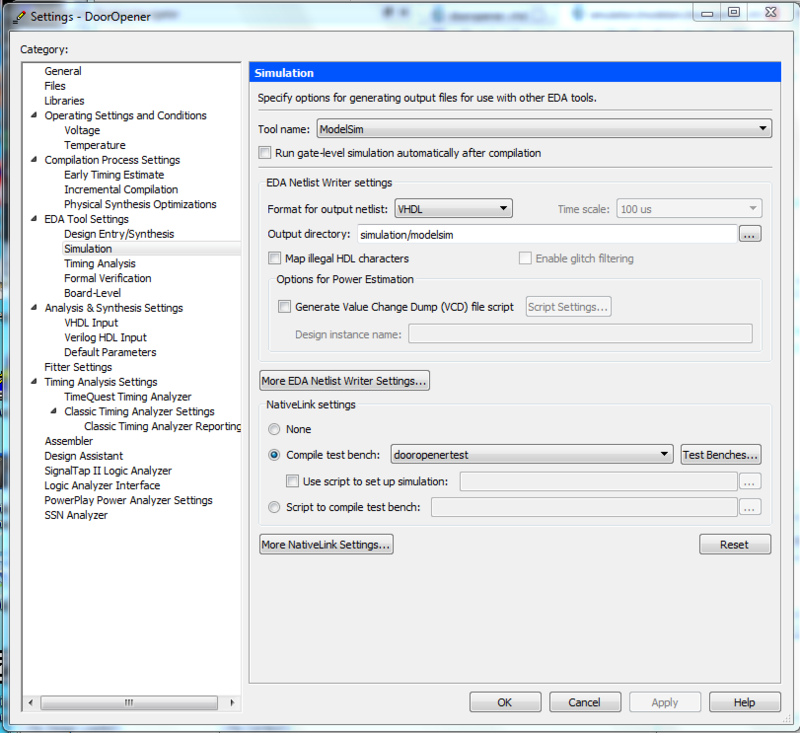 In the Category list, select EDA Tool Settings | Simulation . The Simulation page appears. 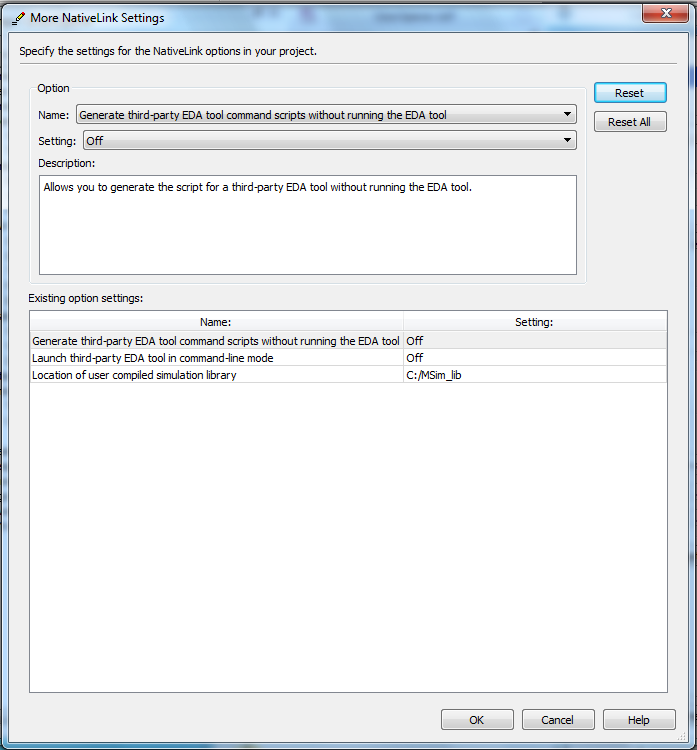 Turn ON Generate netlist for functional simulation only. 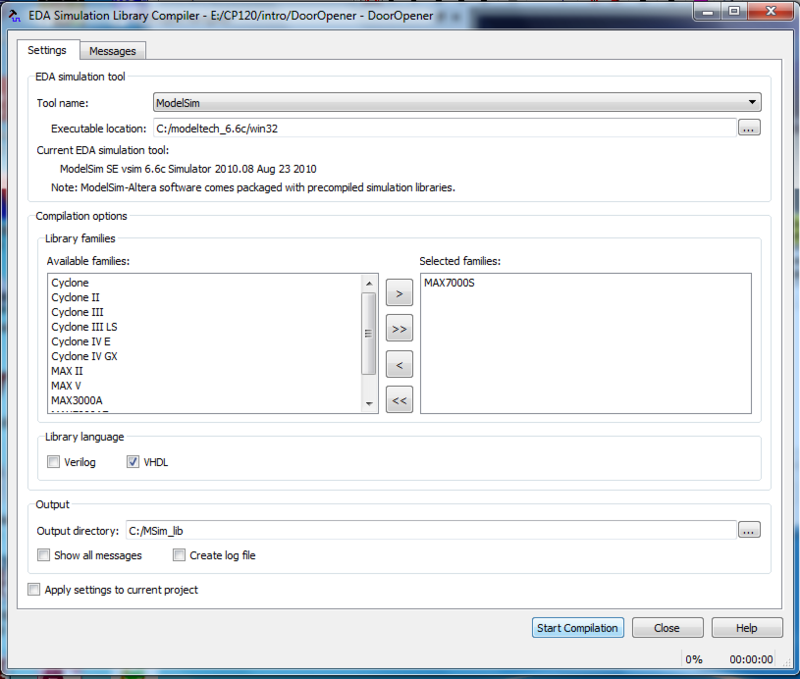 Enter the Location of user compiled simulation library, e.g. C:/MSim_lib [if necessary]. 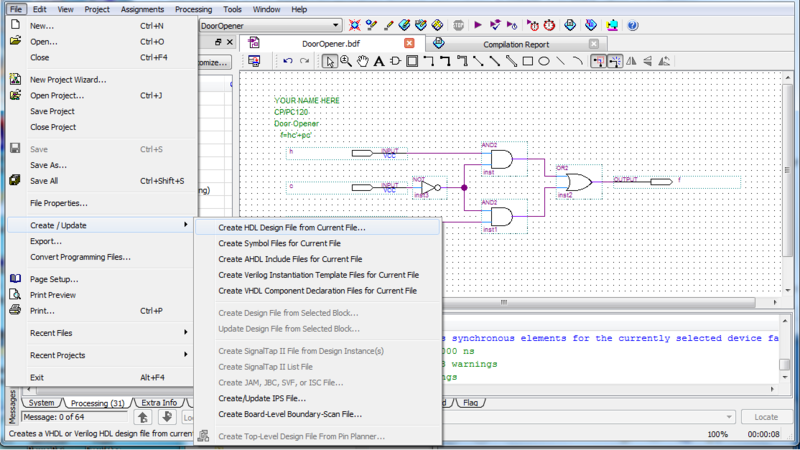 Convert the schematic diagram into VHDL code for simulation. Have the schematic open and then select File | Create/Update | Create HDL Design File from Current File. 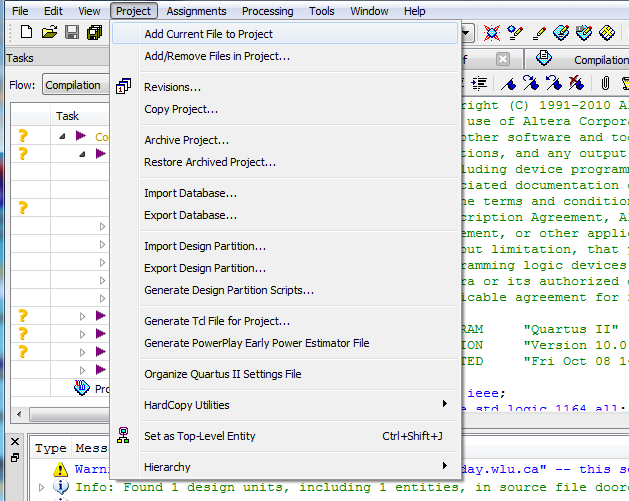 In the pop-up window, select file type as VHDL and the file name will show the name and path of the file. 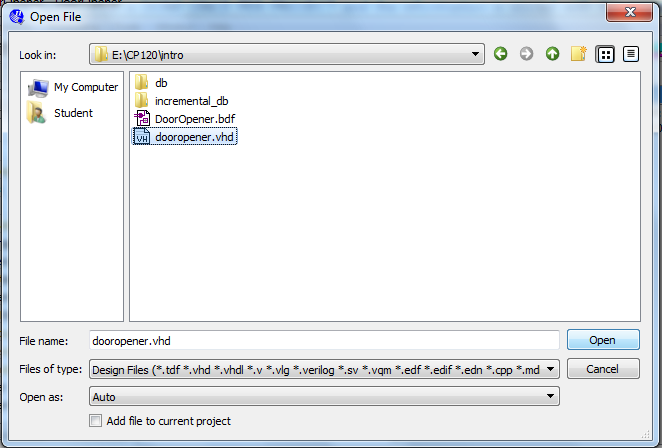 The VHDL file and the BDF file have the same name but different extensions (for example, if your BDF file is example.bdf, the VHDL file created is example.vhd). 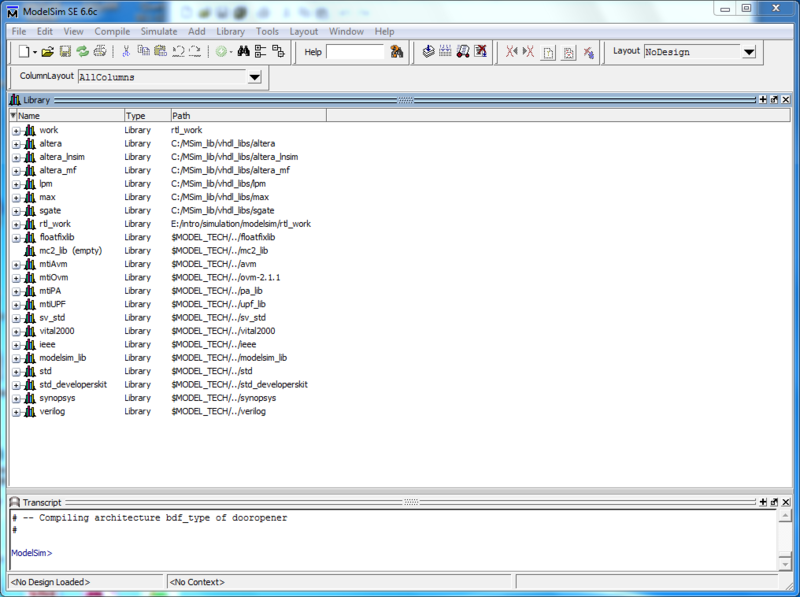 Add the VHDL file to the project and compile for simulation. 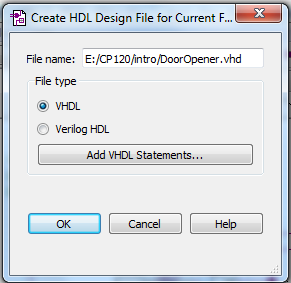 Open the VHDL file using File | Open. Then add it to the project using Project | Add Current File to Project. the architecture which defines what your component does. It may be necessary to compile the libraries for your device family before you simulate. If you are using Modelsim-Altera, you will not need to do this. All of the libraries are precompiled. If you are using Modelsim, you may need to do this. 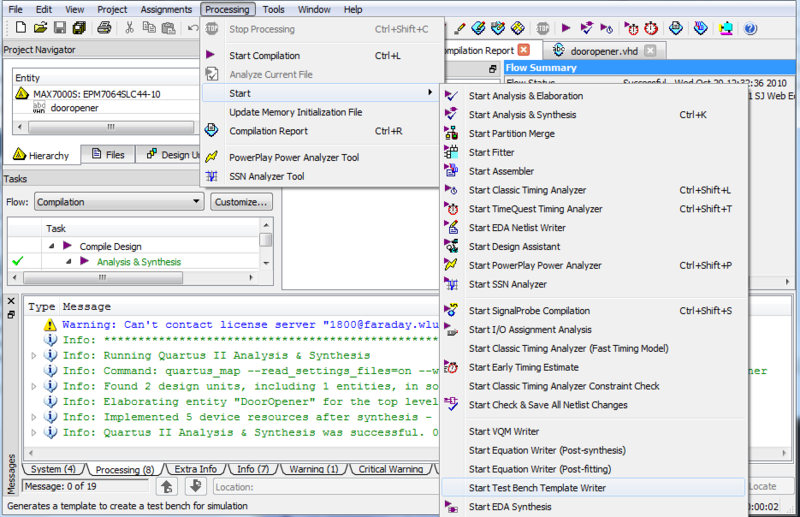 Click on Tools | Launch EDA Simulation Library Compiler. The MAX7000S family should already be selected, so click Start Compilation. Don't worry if you get any error messages. There are three different methods for simulation. The simplest is using forced inputs. It is easy to use with very simple circuits, but is cumbersome with more complicated ones. The next method uses waveforms, which is slightly more complex but well suited to combinational circuits where all that is needed is to go through all possible input combinations. The last method uses testbenches, which is the most complex but the most powerful. For sequential circuits where specific sequences of inputs must be tested, it is essential. 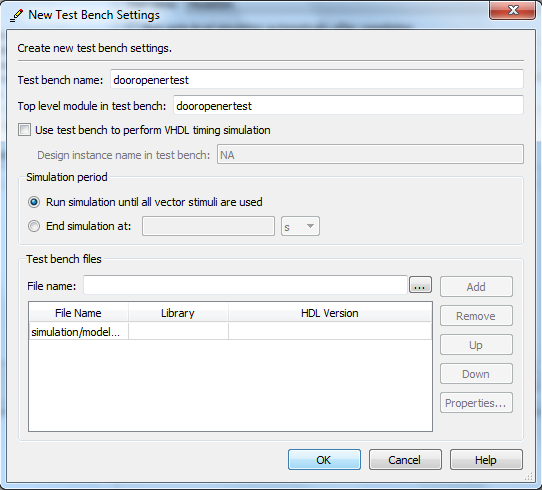 Create a testbench to automate your simulation. You can get Quartus to produce a shell testbench file by selecting Processing | Start | Start Test Bench Template Writer. There will now be a file in your simulation\modelsim directory. Open it. 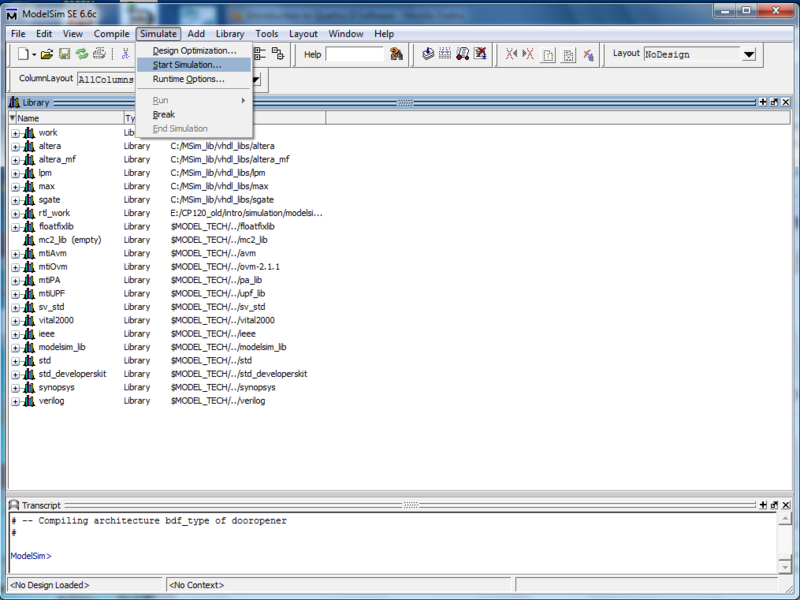 The section near the bottom of the file is where you put statements for your simulation. Insert instructions for how you want the inputs to change through the simulation. After making the changes, you need to change the settings to include your testbench. Give the test bench a name. It doesn't have to be the same as the file name. Now add the testbench file. 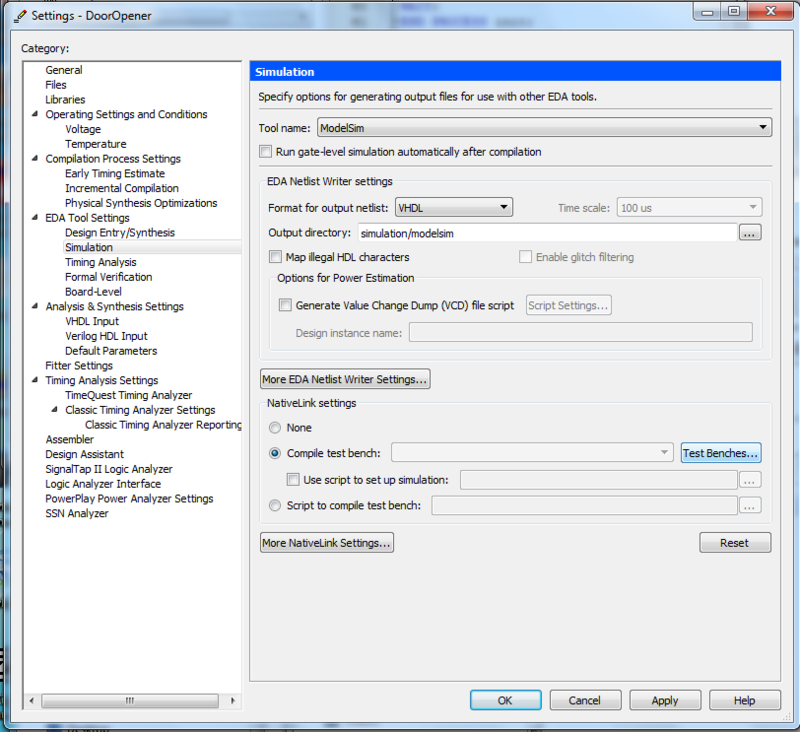 Select OK to close the New Test Bench Settings window.. Select OK to close the Test Benches window.. 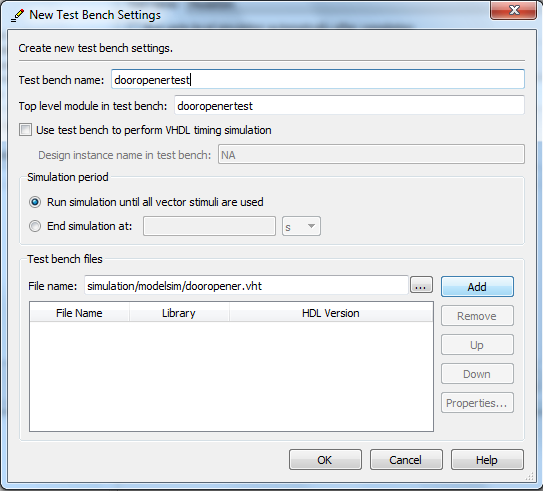 Select OK to close the Settings window..
Add the testbench VHDL file to the project and compile for simulation. 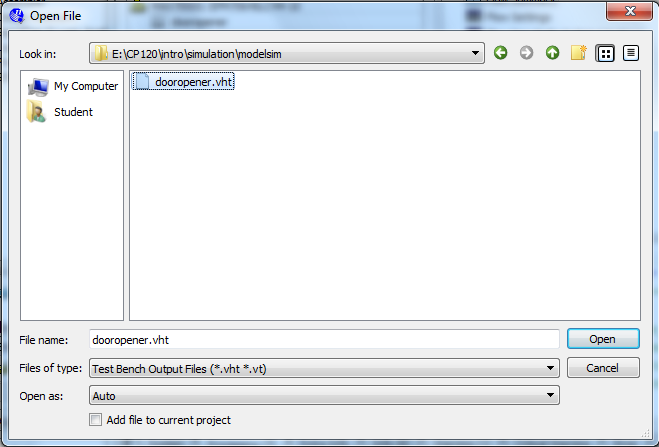 If it's not open, open the testbench VHDL file using File | Open. 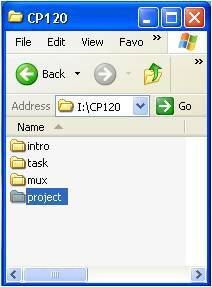 Then add it to the project using Project | Add Current File to Project. 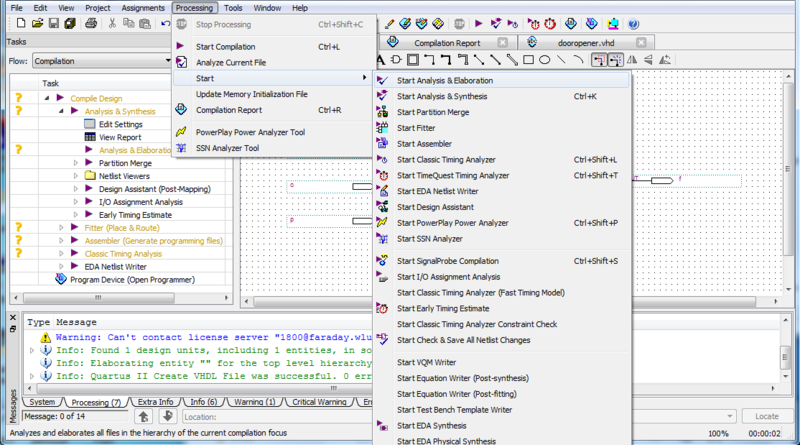 Compile the circuit for a functional simulation by selecting Processing | Start | Start Analysis & Elaboration. 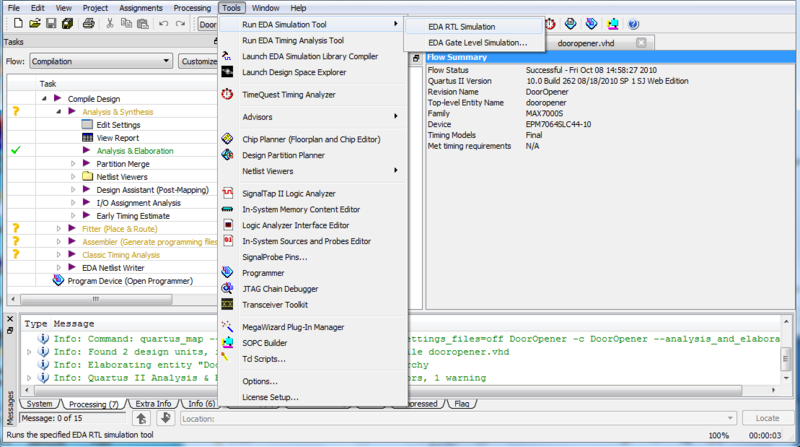 Select Tools | Run EDA Simulation Tool | EDA RTL Simulation. ModelSim will display splash screen. ModelSim will load libraries and compile the project. The transcript pane at the bottom of the screen indicates the scripts that have been run (or are running). 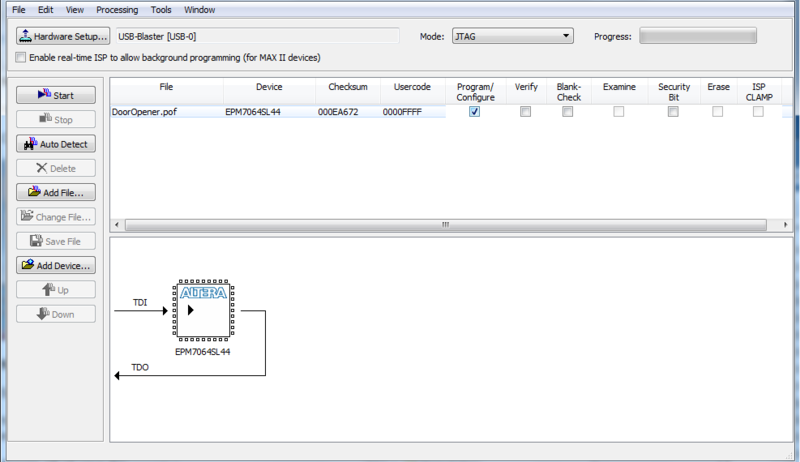 Now your work library will contain two VHDL files; your circuit and your testbench. Select both, and right click to compile both. 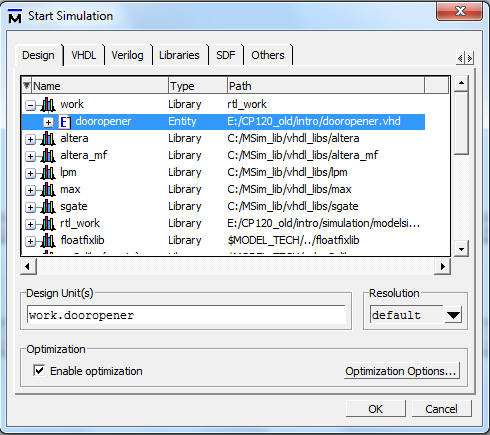 Select Simulate | Start Simulation to put ModelSim in simulator mode. The Start Simulation Window opens. The Start Simulation window contains many tabs. 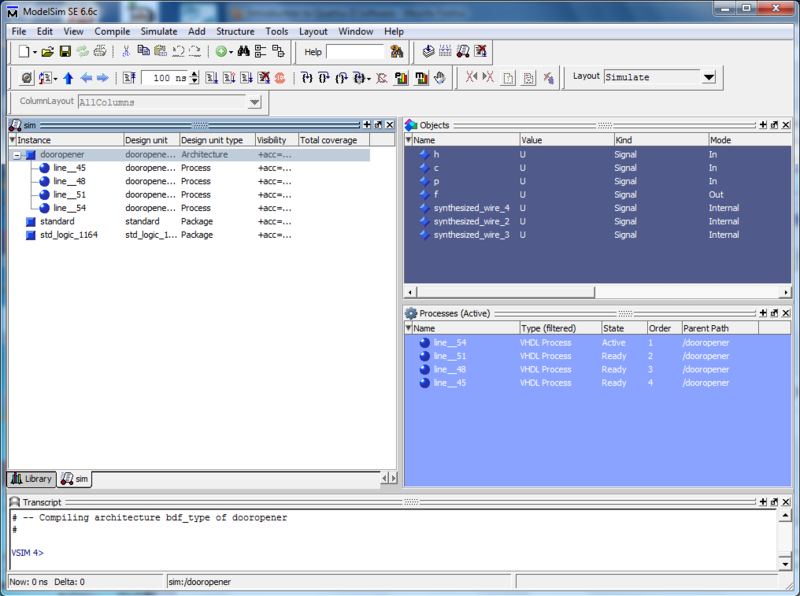 The Design tab lists the designs available for simulation; most are system libraries. 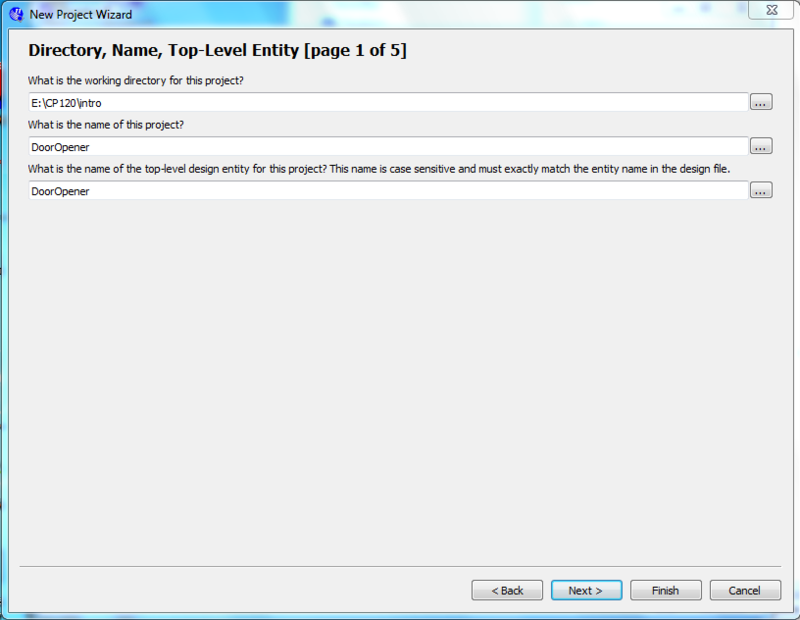 At the top of list will be work (default name for the library containing your program), expand work by selecting the '+'. All components in your design will be listed, select the component that is the testbench. Select OK. This will bring up other panes. Then the left hand side of the screen should now contain a sim tab that displays the design units in your circuit and the supporting libraries. 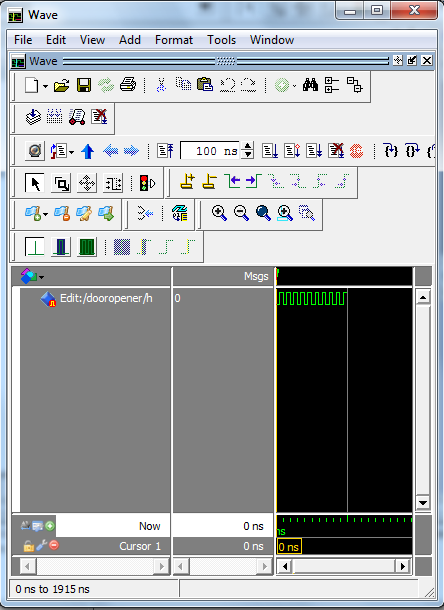 When a design unit is selected in the sim tab, the corresponding signals are shown in the objects window on the right hand side of the screen. Signals that are preceded with a plus (+) sign indicate a bus (a group of wires with common function). 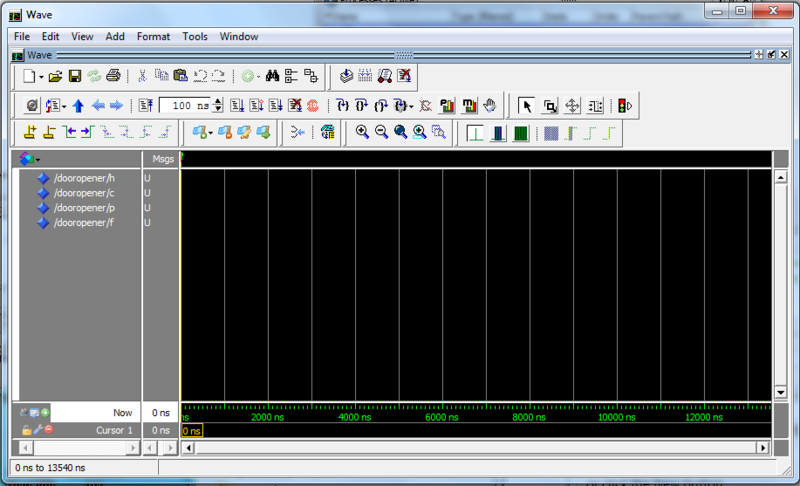 Open waveform window and add signals to be simulated. 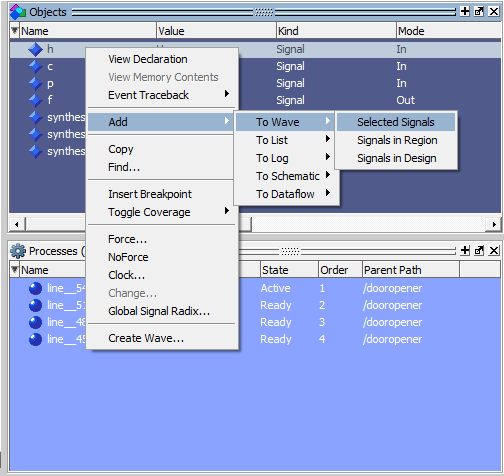 For each signal that you want to add to the simulation, right click on the signal name in the Objects window and select Add | To Wave | Selected Signal. Typically, you would want to add all inputs and outputs. A waveform window will appear in the work area. Alternatively, you can add a range of signals at once by selecting the 1st signal and then, while holding down the shift key, select the last signal in the range. 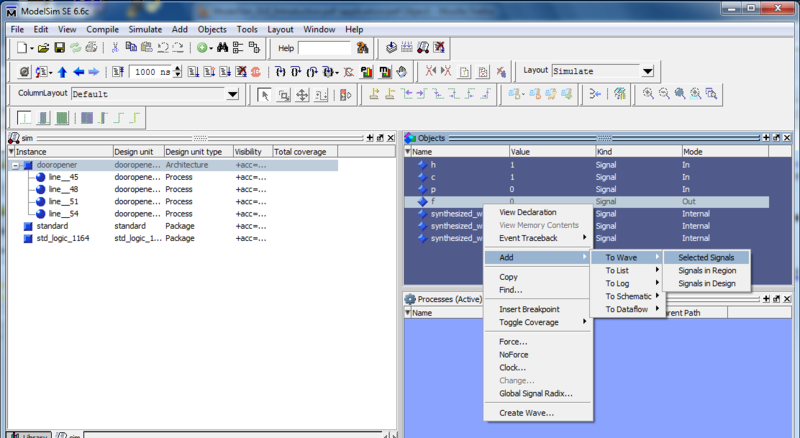 Then right click in the selected signal region and select Add | To Wave | Selected Signals. A waveform window will appear in the work area. When all signals are selected, expand the Wave window. If the Wave window is not floating above the ModelSim main screen, use the top left icon in the wave window to undock the window. Expand the detached window. 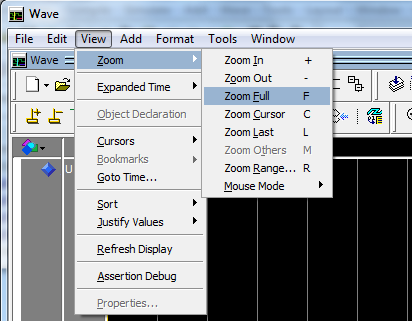 In the tool icons, find the window that contains the period of the signal, e.g. 100ns. Immediately to the right of that window will be the run simulation icon (looks like a page with a blue down arrow beside it). Click on it to run the simulation. 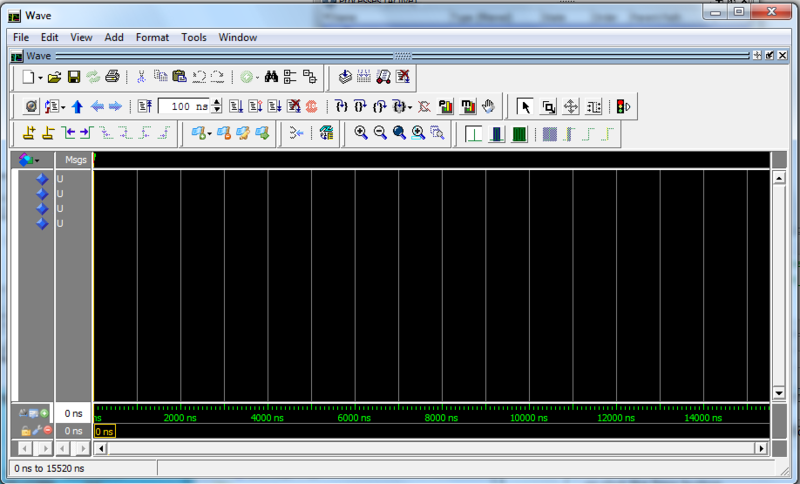 You should see the inputs that you entered and the outputs from your system on the waveform. The period of the run will correspond to the time in the period window. All signals should be green. If any signals are red, then one or more of the inputs was not specified. 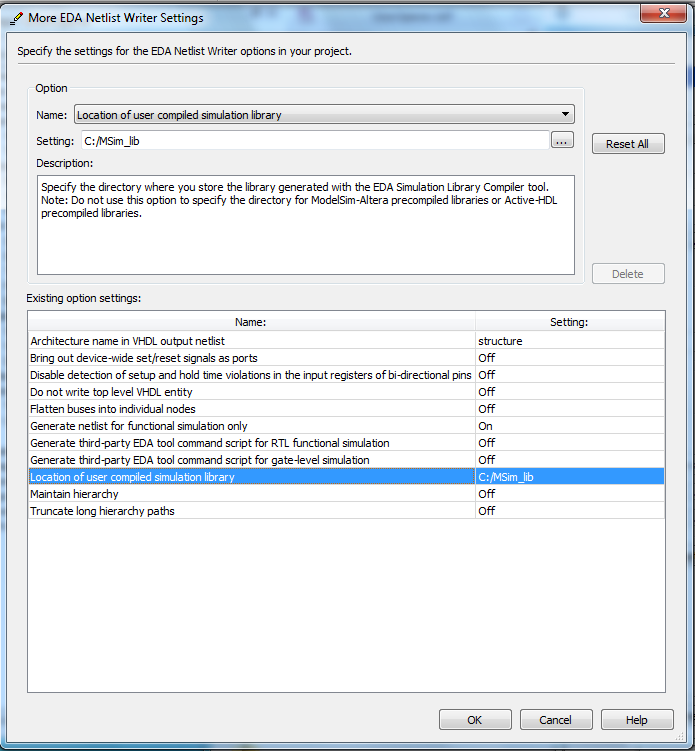 Select Tools | Run EDA Simulation Tool | EDA RTL Simulation. ModelSim will display splash screen. ModelSim will load libraries and compile the project. The transcript pane at the bottom of the screen indicates the scripts that have been run (or are running). Method 1 Expand the "work" library, and start the simulation of the VHDL file by right-clicking on it and choosing Simulate. 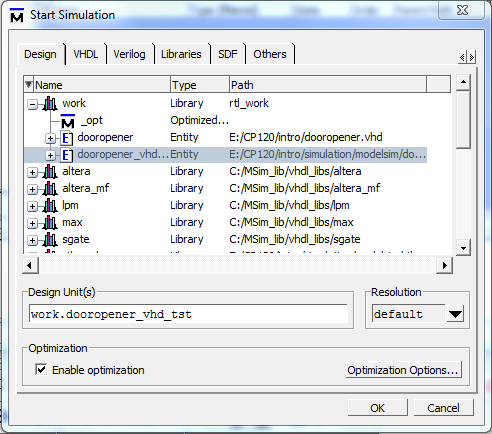 Method 2 Select Simulate | Start Simulation to put ModelSim in simulator mode. The Start Simulation Window opens. The Start Simulation window contains many tabs. 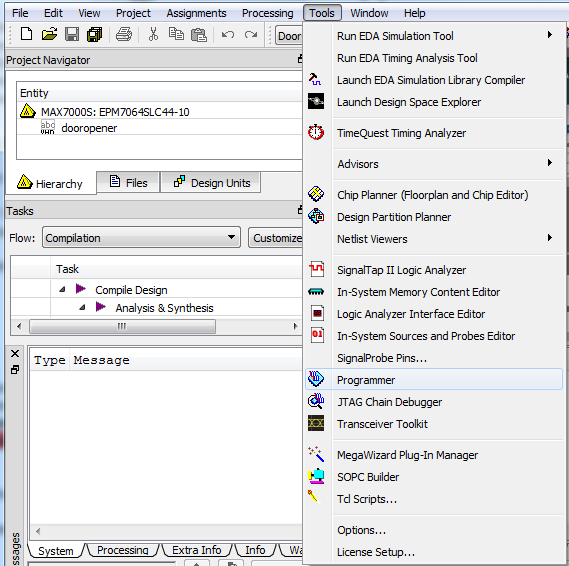 The Design tab lists the designs available for simulation; most are system libraries. 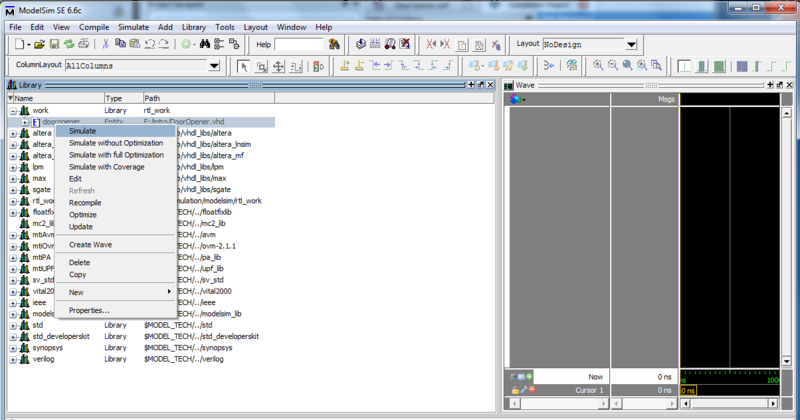 At the top of list will be work (default name for the library containing your program), expand work by selecting the '+'. All components in your design will be listed, select the component (or the top component in a hierarchical design). If appropriate, turn off optimization. Select OK. Enter signal values using force. To enter a signal value on a step by step basis, select an input signal and right click on the pop-up; select Force and for value enter either 0 or 1. [Kind should be freeze, delay should be 0, cancel after should be blank.] Do this for all input signals. Change one of the input signals. Select an input signal and right click on the pop-up; select Force and for value change the 0/1 to 1/0. Click on the icon to run the simulation again. Repeat until all combinations have been tested. 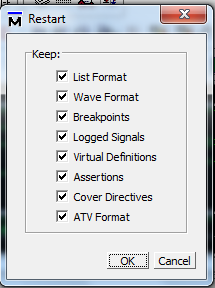 Create signals with the Waveform Editor. For the first input signal that you want to add to the simulation, right click on the signal name in the Objects window and select Create Wave. A waveform window will appear in the work area. A dialog will open for the signal. The input should now show up in the Wave window. Repeat this for each of the input signals. If you are using a counter for each input, you'll want to make the time period for each one twice the previous one. Now add the output signal to the wave window. The wave window should look like this. 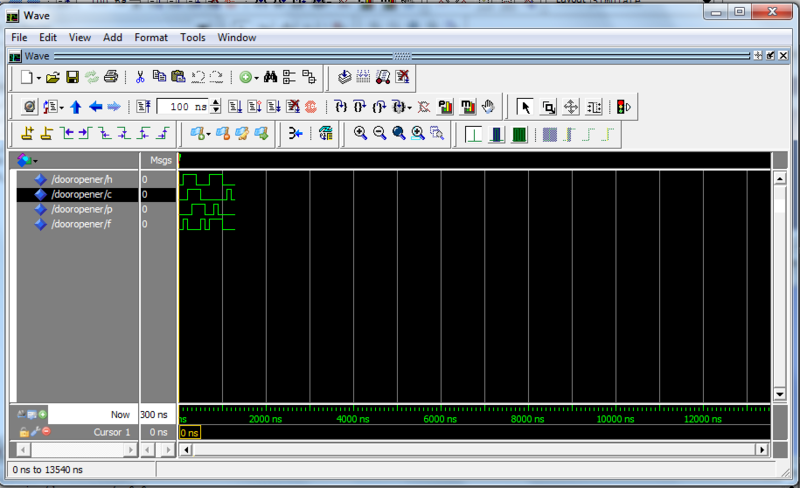 Note the output isn't showing any waveform yet. 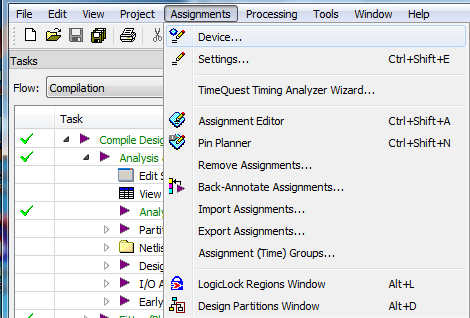 In the tool icons, find the window that contains the period of the signal, e.g. 100ns. Change the period to something long enough to show the whole simulation, e.g. 1000ns. To the right of that window will be the run-all simulation icon (looks like a page with a double blue down arrow beside it). Click it to run the simulation. The output can be zoomed. To zoom back out to see the original, you can go to View | Zoom | Zoom Full. 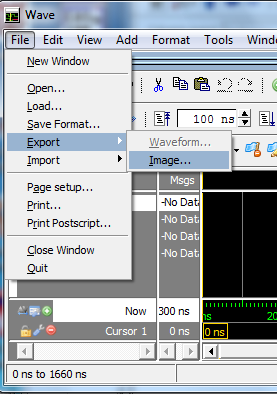 The waveform can be exported to an image file. Immediately to the left of the signal period window is the restart simulation icon. Selecting restart will erase all signal values entered. If you already have a compiled design open, you can skip to assigning pins. You'll be using the door opener from before. Select MAX7000S from the "Family" pull-down list. From the "Available devices" choose EPM7064SLC44-10, which is the device we are using in our lab. Select "OK."
You will need to compile your design. Select Assignments | Pin Planner from the pull-down menu. You'll see a schematic of your device which shows the satus of various pins, with a list of your inputs and outputs below. You will notice that the pins around the edges of the chip have different symbols. The plain round circles with nothing written inside of them are used for input and output. For example, here is bank one. Select each input and output from the bottom of the screen and drag it on top of the pin you would like to use - make sure you click on the name. (ie. if you want h to be pin 4, click h on the bottom of the screen and drag it on top of the circle under the label 4). Remember, use ONLY the plain round circles!! You only need to assign your inputs and outputs; you will probably see some other signals listed that you didn't specify. Leave them as they are. When you are finished you can close the window. 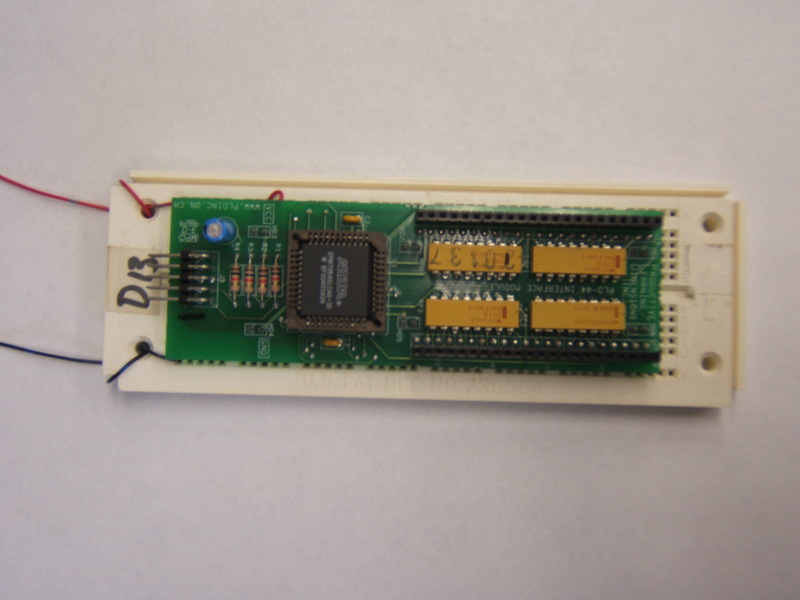 You will need to compile your design again to fit your design on the PLD board. Connect your USB-Blaster cable to one of the USB ports on your computer. After this, the programmer should work. Choose Tools | Programmer. The Programmer window will open. The selected programming hardware is identified as. 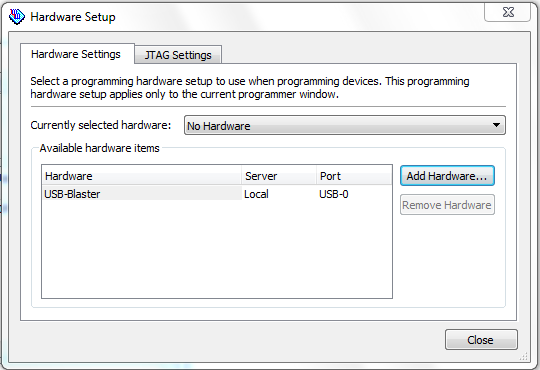 If it says "USB-Blaster [USB-0] mode JTAG" you have the correct hardware (skip to the connection step). Click the Hardware Setup button to open the Hardware Setup window. Programming hardware that is already set up appears in the Available hardware items window. 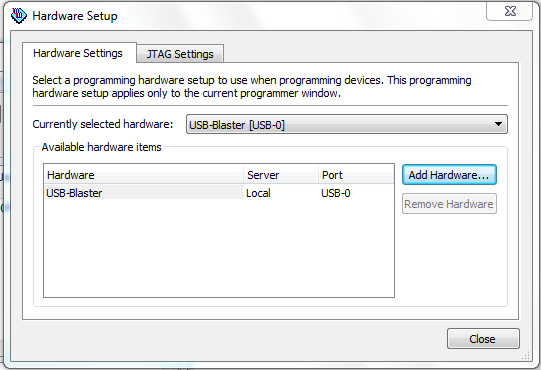 If the USB-Blaster is not listed as the Currently selected hardware, select it and click the Add Hardware. 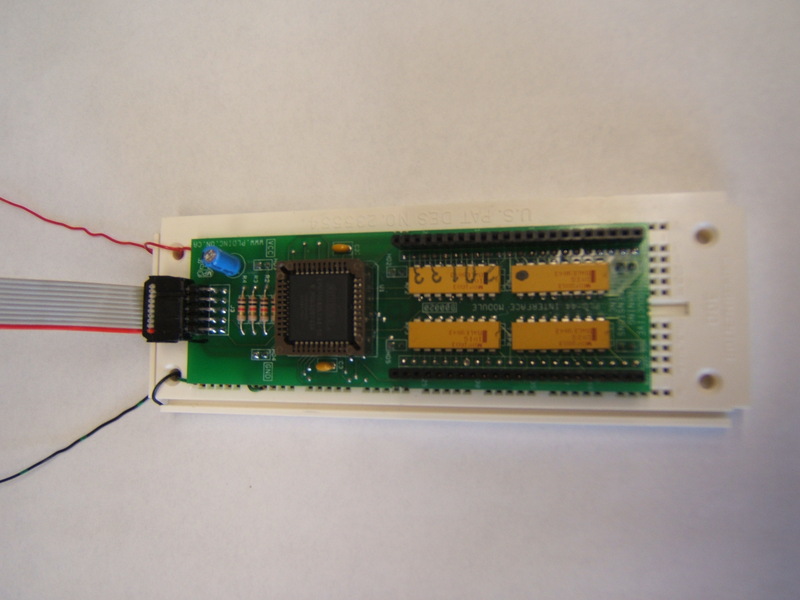 Connect CPLD board to USB-Blaster cable (connected to a USB port on your PC). The cable should be attached so that the red edge of the USB-Blaster cable is next to the number (usually a "1" or a "2") that has been written on the board with a marker. IF YOU'RE NOT SURE, ASK!!! 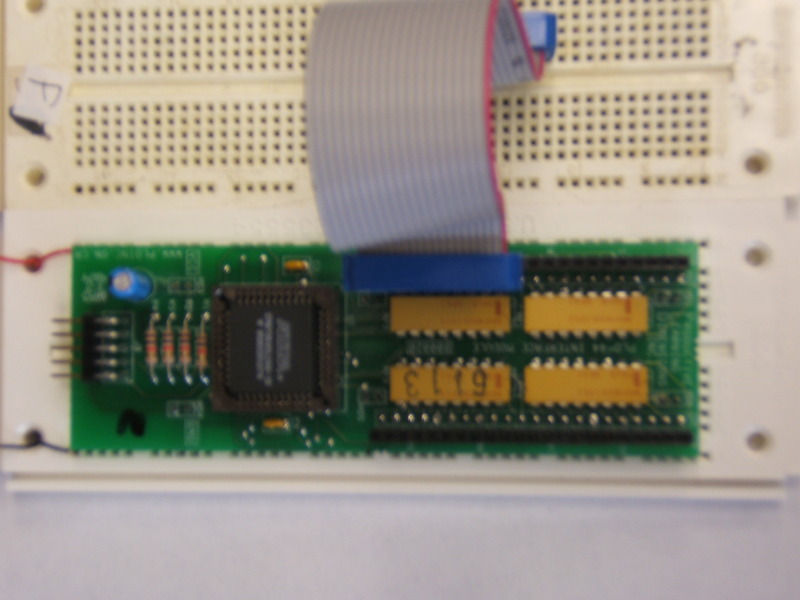 Connect the ground and power (5v) to the CPLD board and turn the power on. Click Auto Detect, your program should detect the CPLD. You haven't chosen the correct device. Your cables aren't connected correctly. Unable to scan device chain. Is the power and ground connected properly and turned on? Is the red strip on the USB-Blaster cable connected to the proper side of the board? Unplug the USB-Blaster cable and reconnect. Try a new USB-Blaster cable. This is generally a problem if you haven't done anything with the software recently. The server times out and loses the connection to the licencing file. Once it autodetects correctly, you can proceed. Delete the file that shows up. Select Start, you should see the progress indicator increasing slowly (fast means problem). You can unplug the USB-Blaster cable and turn off the power while you are wiring your circuit. You will not lose your program. First, double check your simulation to ensure that your Quartus design is correct. If it is not correct then you will not get the correct output no matter how well everything else is connected. Next, check your device, even if you think it's right... double check. If you need to change it make sure you recompile. Check your pin assignments and make sure you have not assigned any of your inputs or outputs to reserved pins or specialized pins. Plain circles only (with no writing inside). 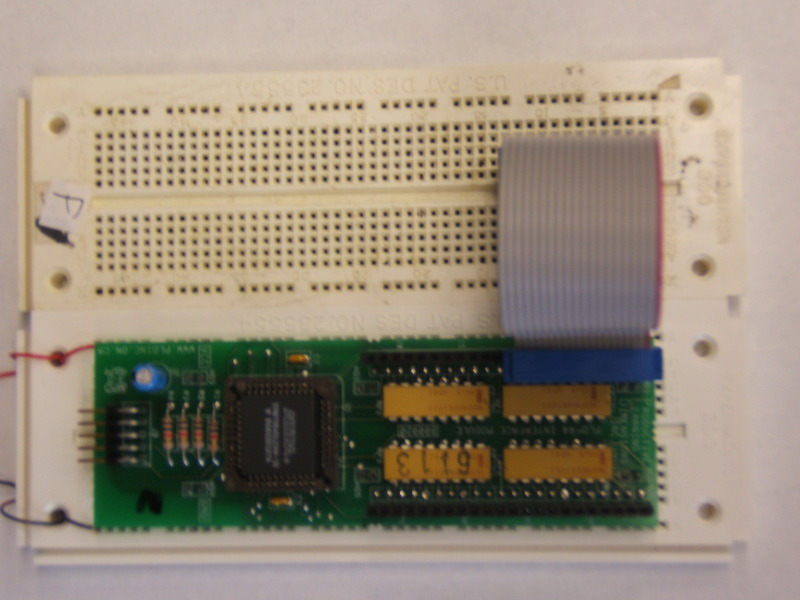 Make sure you have power and ground to your boards (CPLD, debugger, breadboard). Make sure you have the debugger board set up for input and output correctly. If some signals seem to be right and some seem to be wrong, check your pins to make sure you are in the correct place and use the multimeter to ensure you have good connections.